"To further the well-being of the college and its graduates by increasing the interest of members in the college and in each other." The year was 1881 and members of the class of 1880 gathered on campus to celebrate their first Reunion. As they watched the new group of graduates, the young alumnae were overcome with a sense of pride in Smith’s educational legacy and immediately felt responsible for instilling those same feelings in future classes. 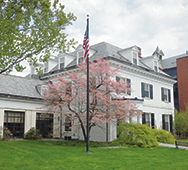 Forty-seven alumnae first pledged to uphold that mission, and to this day the Alumnae Association of Smith College, which was officially incorporated in 1931, has never strayed from it. Originally conceived as a dues-paying organization, the association is now all-inclusive and boasts a worldwide membership of more than 40,000 alumnae. It has grown and prospered into a vital organization that continually meets the needs of alumnae and the Smith College community.